Photo by Chris Dant Bear Basin tower overlooks a sweeping landscape. Perhaps it is the sense of danger and risk that comes from being so vulnerable to lightning strikes or buffeted by ridge top winds? The magnificent 360-degree views? "Woke up this morning on an island in the sky, surrounded by clouds," wrote Edward Abbey from his post in Arizona's Atascosa fire lookout. Philip Connors, whose recent book, Fire Season, recalls his decade of staffing a fire tower in New Mexico, talked about "the impressive stage set for a drama of the self." For me, it is certainly possible that my attraction is about compensating for a quarter of a century of being limited to scanning the flatlands of Kansas. Or maybe I hope to join the literary pantheon who found their muse in a remote lookout retreat -- Snyder, Abbey, Jack Kerouac, Norman Maclean, and, well ... Hughes? Fire lookouts are fast going the way of the typewriter, Kodachrome and the handwritten letter. According to Connors, 90 percent of American lookout towers have been decommissioned with only a few hundred remaining, mostly in the West and Alaska. Not surprisingly, there was a time when high spots throughout inland Humboldt County were dotted with lookouts. They stood atop places like Brannan Mountain, Cold Spring, Iaqua Buttes, Mt. Pierce, and Somes Mountain. Now most functional Humboldt County fire lookouts, like Grasshopper Peak, Schoolhouse Peak, Brush Mountain, and Orleans Mountain, are staffed only in situations of extreme fire danger. They command incredible views and are worth a visit on a beautiful North Coast afternoon. Grasshopper Peak has become a favorite destination for masochistic mountain bikers. Schoolhouse Peak is a nice turnaround after a drive along Bald Hills Road in Redwood National Park (or join the Redwood Parks Association there on Aug. 11-12 to watch the Perseid meteor shower -- call 707-464-9150 to make a reservation). 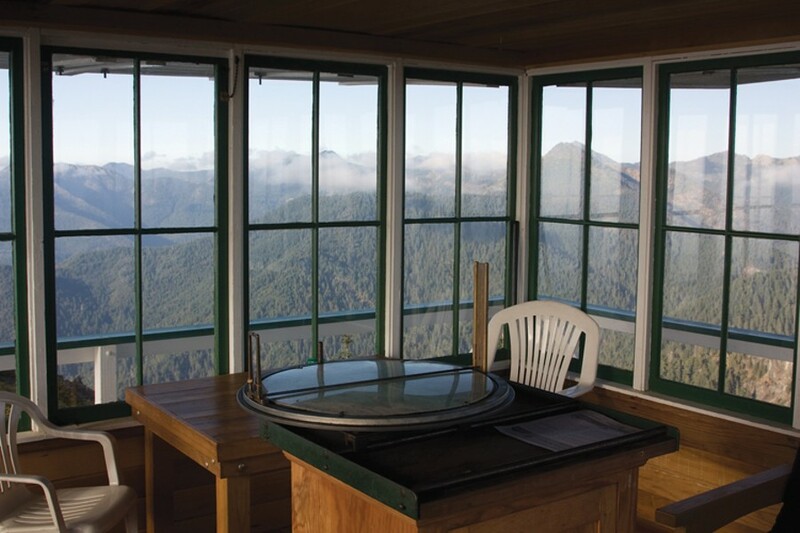 Brush Mountain Lookout, the only one fully staffed in Humboldt County (June through mid-October), welcomes visitors and is easily accessible from Friday Ridge Road southeast of Willow Creek. Much of this change reflects not only improvements in technology but a philosophical shift in the role that fire plays in forest ecology. Not all fires are bad. It has been increasingly recognized that our ecosystem has evolved so that periodic fires are critical to the maintenance of a healthy balance among plant communities. Along the North Coast, for example, without natural fires the inland prairies and native oak woodlands are quickly overwhelmed by young conifers. It is estimated that about a third of Humboldt County's oak woodland acreage has disappeared since 1850. These days there are ways for us to have a little taste of this top of the world experience without being hired for a fire season. Some of the lookouts have been converted to mountain penthouses and are available for rent. There are three in Shasta-Trinity National Forest and another four in the Rogue River National Forest in southwestern Oregon. And, there is one extraordinary lookout perched high above the Smith River drainage in Six Rivers National Forest -- Bear Basin Lookout (and the Pierson Cabin). We spent an early July weekend at the Bear Basin Lookout; early enough that we had to park below the remnant snow drifts and lug our gear, food, and water along the access road to the panoramic top of Bear Basin Butte. We quickly ran out of superlatives. Stunning. Incredible. Breathtaking. Awesome. Fantastic. The lookout itself is actually the reconstructed Camp Six Lookout, which had been on the top of a much taller tower a couple of ridges to the west. That lookout was initially built by the Civilian Conservation Corps in 1935 at the sixth construction camp for the French Hill Road (hence Camp Six). It operated into the 1990s. Later, it was moved to Bear Basin Butte and a new cabin modeled after the old Conservation Corps cabins was built nearby with the help of the Pierson Building Center. This is where most contemporary visitors stay. Between the lookout and the cabin, eight people can be accommodated (up to 12 are permitted but there is an extra fee). There are three double beds in the cabin and a futon in the lookout. You have to bring your food (it would be a good hour and a half round trip to go buy the milk you forgot to bring), your bedding and all of your water. There is no electricity and, mercifully, no Internet. There remain a few sacred places. Even in our brief two-night stay, with no television or Internet, time does slow. We took walks along nearby forest service roads, imagined locating a distant wisp of smoke with the Osborne fire finder, sat mesmerized as day succumbed to night. I never tired of just sitting and watching the spectacle of the Klamath Knot (the term for our unique geological and ecological region, popularized by David Rains Wallace) laid out before us. In the absence of traffic noise and the subtle drone of civilized life, I became more attuned to the whisper of wind rolling up and across the mountainside, the call of the red-tailed hawk riding afternoon thermals, the silent melody of this wild country. And then there is the miracle of nighttime. If the cycle of the moon is right, you will experience real darkness, as Bear Basin Butte is far from the star-obscuring ambient light of civilization. Environmental writer Paul Bogard reports that an estimated two-thirds of Americans live with such light pollution that they no longer experience real night and that children born in the United States today only have a one in 10 chance of seeing the Milky Way in their lifetime. It only takes one clear night at Bear Basin to understand the difference. Buoyed by this experience, I quickly reserved a night at Bald Knob Lookout in the Rogue River-Siskiyou National Forest. I assured my family as we made the long drive inland from Gold Beach that we would soon be basking in the sunshine high above this tenacious layer of coastal stratus. My meteorological savvy failed me that day, as my wife is still quick to remind me. "But even surrounded by clouds," I valiantly tried to convince my daughters, "isn't this amazing? It is like living in a ball of cotton." I loved that experience too.